A French judge has ordered ex-President Nicolas Sarkozy to stand trial in an illegal campaign finance case. Mr Sarkozy faces accusations that his party falsified accounts in order to hide 18m euros (£15m; $20m) of campaign spending in 2012. 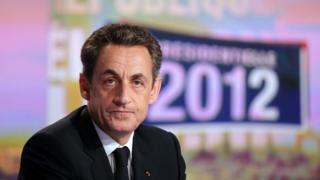 Mr Sarkozy denies he was aware of the overspending, and will appeal against the order to stand trial. He lost the 2012 race, and failed in his bid to run again in this year's upcoming presidential election. What charges does Mr Sarkozy face? The case is known as the Bygmalion scandal. It centres on claims that Mr Sarkozy's party, then known as the UMP, connived with a friendly PR company to hide the true cost of his 2012 presidential election campaign. France sets limits on campaign spending, and it is alleged the firm Bygmalion invoiced Mr Sarkozy's party rather than the campaign, allowing the UMP to spend almost double the amount permitted. Employees at Bygmalion have admitted knowledge of the ruse and several UMP members already face charges. The investigation into Mr Sarkozy centres on whether the ex-leader was aware of the alleged fraud. Thirteen other people are also expected to be tried. However, Mr Sarkozy's lawyer, Thierry Herzog, has said he will launch an appeal against the trial order, because only one of the two judges handling the case signed the order. "The clear disagreement between the two magistrates in charge of the matter is such a rare event that it is worth underlining, as it illustrates the inanity of the decision," Mr Herzog said in a statement. The development comes as other French politicians have faced questions over their financial dealings. Francois Fillon, who beat Mr Sarkozy to become the centre-right's candidate for the presidential race, is accused of misusing public funds to employ his wife and two children. Meanwhile, the European Parliament is demanding France's far-right leader Marine Le Pen return funds it says she has misspent, by paying an aide at the National Front party's headquarters in Paris. Mr Sarkozy is the second French president to be put on trial since 1958, when the current French republic was established. Former leader Jacques Chirac was given a two-year suspended prison sentence in 2011 for diverting public funds and abusing public trust. As president, pushed through reforms including raising the retirement age from 60 to 62 and relaxing the 35-hour working week.